3 INF Div Ord Unit, 14 Corps OMC, 254 ARMD BOU & 118 (I) INF Bde GP OMC, Across India. 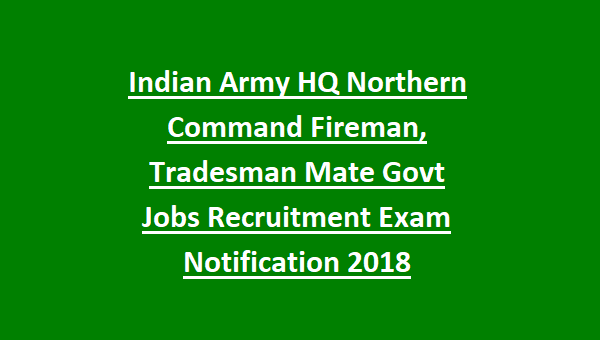 Candidates can apply for the HQ Northern Command Fireman, Tradesman Mate posts in a prescribed forma to Commanding Officer 8 Mtn Div Ord Unit, PIN : 909008, Clo 56 APO. Last date for the HQ Northern Command Fireman, Tradesman Mate posts is 21 days from the notification given in employment news. Candidates who are applying for this HQ Northern Fireman, Tradesman Mate jobs should have passed 10th (Matriculation) and Graduate. Candidates can apply through online mode. 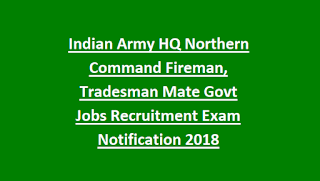 The official website for applying for this posts HQ Northern Fireman, Tradesman Mate is http://indianarmy.nic.in before closing date of form submission. Before apply for this posts candidates will be register with official website. The other details of HQ Northern Command Fireman age limits, educational qualification, selection process and how to apply are given below. Available vacancies for the Indian Army HQ Northern Command Tradesman recruitment Notification 2018 is 130 posts. Age relaxation for the candidates belongs to SC/ST/OBC/PH/PWD is as per the Government rule regulation. Candidates will be shortlisted based on their qualification marks. Those who are shortlisted they are only called for written exam for these Northern Command vacancies of Indian Army. Preference will be given to the candidates who are having merit in qualifying exam. Written exam qualified candidates are called for physical tests and documents verification. Those who cleared all the above they will receive appointment letter. Candidates who are interested in this Northern Command vacancies they can send their application form in a prescribed format along with all necessary documents to below given address.